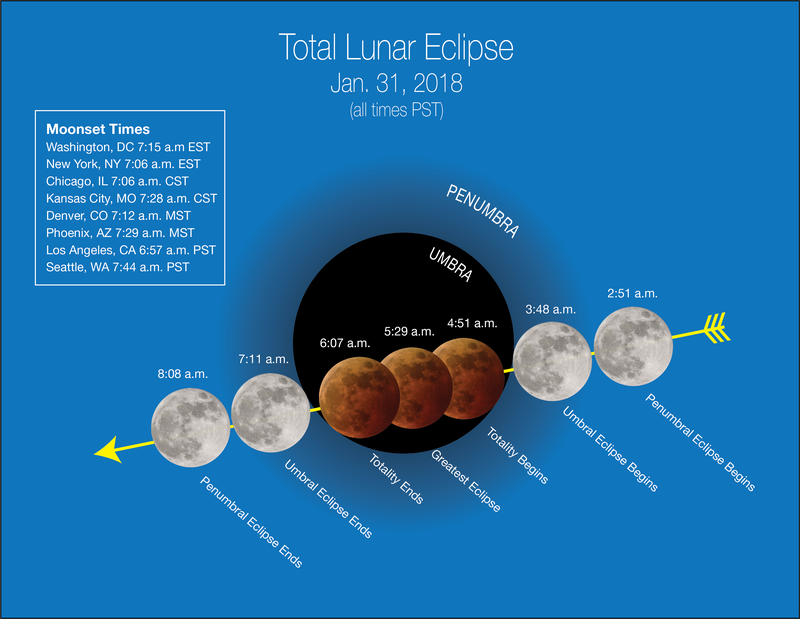 During the early hours of Jan. 31, there will be a full moon, a total lunar eclipse, a blue moon and a supermoon — all at the same time. None of these things is really all that unusual by itself. What is rare is that they’re happening all together on one day. Like the Earth, half the moon is illuminated by the sun at any one time. The moon orbits around the Earth and as a result we see different amounts of the lit-up side. The phases of the moon visible from Earth are related to its revolution around our planet. A full moon is when we see its entire lit-up side. This occurs every 29.5 days, when the moon is directly opposite the sun relative to the Earth. Jan. 31 will be our next full moon in the lunar cycle. The moon’s orbit is tilted by about 5 degrees relative to the Earth’s orbit. So, most of the time the moon ends up a little above or below the path Earth follows as it revolves around the sun. But twice in each lunar cycle, the moon does cross into our planet’s orbital plane. A lunar eclipse happens when the moon is completely in the Earth’s shadow. If that crossing corresponds to a full moon, the moon will pass into the Earth’s shadow, resulting in a total lunar eclipse. Since the moon needs to be behind the Earth, relative to the sun, a lunar eclipse can only happen on a full moon. To see the phenomenon, you need to be on the night side of the Earth; this eclipse will be visible mostly in Asia, Australia, the Pacific and North America. But don’t worry if you miss it, lunar eclipses happen on average a couple times a year. The next one visible in North America will be on Jan. 21, 2019. When a lunar eclipse happens, the moon appears to darken as it moves into the Earth’s shadow called the umbra. When the moon is all the way in shadow it doesn’t go completely dark; instead, it looks red due to a process called Rayleigh scattering. The gas molecules of Earth’s atmosphere scatter bluer wavelengths of light from the sun, while redder wavelengths pass straight through. This is why we have blue skies and red sunrises and sunsets. When the sun is high in the sky, red light passes straight through to the ground while blue light is scattered in every direction, making it more likely to hit your eye when you look around. During a sunset, the angle of the sun is lower in the sky and that red light instead passes directly into your eyes while the blue light is scattered away from your line of sight. In the case of a lunar eclipse, the sunlight that makes it around Earth passes through our atmosphere and is refracted toward the moon. Blue light is filtered out, leaving the moon looking reddish during an eclipse. On top of it all, the Jan. 31 full moon is also a considered a blue moon. There are two different definitions of blue moon. The first is any time a second full moon occurs in a single month. Since there are 29.5 days between two full moons, we usually only end up with one per month. With most months longer than 29.5 days, it occasionally works out that we have two full moons. We already had one on the first of this month and our second will be Jan. 31, making it a blue moon. With this definition our next blue moon is in March, leaving February with no full moon this year. The second definition of a blue moon states it’s the third moon in a season in which there are four moons, which happens about every 2.7 years. We’ll only have three this winter, so the Jan. 31 full moon won’t be blue by this definition. Stargazers will need to wait until May 18, 2019, for a blue moon that fits this older, original definition. Finally, to add the cherry on top, this will also be a supermoon. The moon’s orbit is not perfectly circular, meaning its distance from Earth varies as it goes through one cycle. The closest point in its orbit is called the perigee. A full moon that happens near perigee is called a supermoon by some. This happened with our full moon earlier this month on Jan. 1 and will again on Jan. 31. Its proximity makes it seem a little bit bigger and brighter than usual, but that’s the extent of its effects on Earth. The distinction is usually hard to notice unless you’re looking at two pictures side by side. There are long traditions of giving different moons names. This being a bigger, brighter, reddish-looking blue moon, perhaps we should call the next full moon the super purple moon. The moon will not actually appear purple, nor will have it a cape — but Jan. 31 is a great time to gaze up and enjoy the night sky.